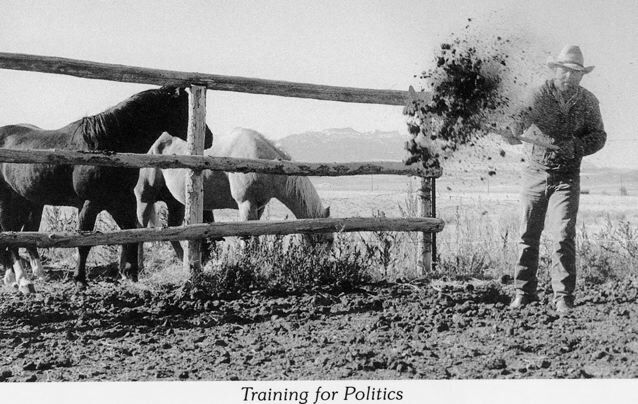 The photo could also be captioned: "Training for a Media Executive". Mainstream media dishes out unreality, trivia, fear and narcissistic drivel. If you haven't already begun to ignore mainstream media, you have a learning disability. The recent obituary of George Trow, Jr., who wrote for The New Yorker and National Lampoon, quoted an article he wrote in the 1980s: “The work of television is to establish false contexts and to chronicle the unraveling of existing contexts; finally to establish the context of no-context and to chronicle it.” Sounds like the nightly news. Trow was not alone. In 1960 the then-Librarian of the Library of Congress and Director of the Smithsonian Museum of American History, Daniel Boorstein, published an extraordinary book, “The Image”, in which he warned that the greatest danger to America was “the threat of unreality”. This idea did not originate with Boorstein, but rather from, of all persons, Thomas Jefferson, whom Boorstein had studied. Jefferson placed his faith in the empirical study of nature (reality) and worried that the then-newly popular literary form of the novel (by definition unreal and “fiction”) would detract from the study of reality and confuse people with untruths. Has this happened? When we think of American cowboys, do we think of John Wayne? In our mind’s eye, when we think of Vietnam, do we picture the actual country of Vietnam or do we picture a (fiction) movie about Vietnam? The Army Rangers recently inducted an actor into their Hall of Fame for his role in a (fiction) film. A common ad line for films is, “based on real events”. Does this mean that the film is real? Institutions have their own reasons for obscuring the truth. In the late ‘60s, a reformed ad man, Gerry Mander, published “Four Arguments For The Elimination of Television”, in which he detailed advertisers’ intentional blurring of the distinction between reality and unreality, and the replacement of the viewer’s thoughts through what he called “thought interruption”. Businesses were the first to employ these techniques to sell widgets, but governments soon adapted the same (marketing) techniques to sell themselves, i.e. to sell big government. I have two friends, both of whom are real cowboys. The first rarely watches television or movies. The second is addicted to cowboy movies, and even uses scenes from the movies to illustrate life’s lessons. The first cowboy has a pretty serene personal life. The second has a tumultuous and occasionally violent personal life. Any connection? Is the second man losing sight of the line between reality and unreality? What about the nightly news? Is it real? Boorstein thinks not. Boorstein says that the power of God to create newsworthy events was, in the middle of nineteenth century, exceeded by the capacity of the media to present such events. The media needed more “news” to fill up their excess capacity, so they invented the “celebrity”, a person who is famous for being famous. This excess capacity led to a need for additional “newsworthy” real events, like wars, and to the Spanish American War, a cooperative project between a bored rich boy who was fresh out of adventure (Teddy Roosevelt), and Hearst Publications. Can anyone deny that the media today, 1,000 times larger than the old Hearst Publications, does not thirst for death and destruction, controversy and mayhem? Does the media have an interest in making our lives less traumatic and less “newsworthy”? I think not. The invention of the “commentator” (someone who explains what someone else just said) is yet another device to fill the media’s excess capacity. But if mainstream media does not want to tell us about select realities, they need not. And, unless we want to spend our weekends sleuthing the internet, how will we know what is real? Does Israel have nuclear weapons? Did the medical personnel at Dallas’ Parkland Hospital agree that John Kennedy took two shots from the front? Did our armor-piercing warheads and small arms poison Iraq with aerated depleted uranium? Did we finance Saddam Hussein’s Scud missile launchers and supply the building blocks for his chemical weapons? Did the CIA sponsor the Mujahadeen? Did we kill 3.8 million Vietnamese and Laotians some thirty-five years ago (as McNamara’s book claims)? Does mainstream media withhold information which, if known, would lead to a reduction of newsworthy events, such as our current, perpetual war? What is real? Does America face a profound threat from the Muslim World? The media would hope so, for such a threat would keep Americans glued to their television screens. Can we quantify this threat? Five years ago, on 9/11, Americans lost 3,000 lives. During the five years of WWII and the two years following, the Germans lost 3,000 people a day -- every day for seven years. The Russians lost 15,000 lives a day for every year of the four years they fought in that war. Every day. We don’t see an endless procession of retrospects or tributes to the German seven million or to the Russian 27 million but, in America, the media and the government can’t stop whining about our 3,000. Why? The solution to the Muslim “threat” is pretty simple – get out of their countries, stop toppling their governments, stop buying their dictators, stop quartering our troops in their countries, stop inciting wars in their countries, stop arming their enemies, stop arming them, stop invading them, stop bombing them, stop embargoing them, stop stealing their resources and stop badmouthing their religions and cultures. These are not my ideas, but rather the ideas of Osama bin Laden, as published all over the internet in his letters, but never published in mainstream media. Why not? Because the media, like the military-industrial-intelligence complex does not want a solution. They want the problem to continue because, for them, the problem is their growth industry. In other words, we will continue to use carbon fiber Stealth Bombers to hunt down guys in caves; and we will continue to film it and comment on it, all in exquisite detail. And the military-industrial-intelligence complex, big government and mainstream media will continue to grow. And we Americans will never really understand it, because we can’t sort out the real from the unreal. Is what we see on CNN, FOX, NBC and PBS real? Is Rush Limbaugh lying? Was Tom Mix a real cowboy? Was Buffalo Bill a buffalo hunter or just a circus showman? Was Rumsfeld hardened in combat or was he also just a showman? What about Schwartzenegger? And what about that actor in the Army Ranger Hall of Fame? 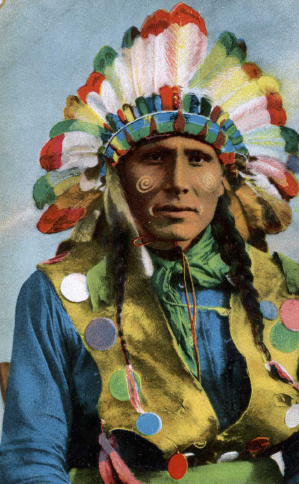 Today, mainstream media treats the American Indians as romantic, sympathetic characters but, in the Old West, media portrayed the Indians as sub-human and savage. The Indian didn't change, but mainstream media altered reality for most people.